Since October 23rd, 2018, everybody has been dying to know who the biggest lottery winner of all times is. 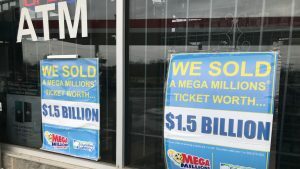 A ticket holder from South Carolina single-handedly scooped the entire $1.537 billion jackpot in the Mega Millions lottery and beat the record previously held by Mavis Wanczyk from Massachusetts who won $758 million in the US Powerball. The months passed by and there was no sign of the Mega Millions winner, until March 2019, when the South Carolinian finally came forward and placed a claim for the Mega Millions jackpot. The identity of the winner will remain a mystery, as he or she has decided to remain anonymous. In South Carolina, lottery winners have the option to keep their identities private. “We respect the winner’s decision to remain anonymous, and we will honor the winner’s wishes.”, said Hogan Brown, the Executive Director of the South Carolina Lottery Commission. It was also revealed that the lucky Mega Millions ticket was purchased as a Quick Pick and that the big win was the fortunate turnout of a good deed. The winner let another customer go in front, which eventually led to him or her purchasing the life-changing lottery ticket. After all, the lottery is a game of chance. The South Carolinian chose the lump sum payout for the win, which amounted to $878 million, before the due federal and state taxes are paid out. The state of South Carolina will cash in $61 million in income taxes, which is great news for them. Since the win was recorded in 2018, the money was already included in this year’s budget.